Semi-permanent procedure that can be maintained with monthly touch-up appointments. Novalash Platinum Bond Extra Strength Adhesive is the world’s best only patent pending formula that is rubberized with a flexibility agent. Platinum Bond won ICMAS’s Product Innovation of the Year in 2007. Novalash Sensitive Eyes Fume-Free Adhesive’s odorless and nonirritating hypoallergenic formula is perfect for use on clients with sensitive eyes or are prone to allergies. This formula is also rubberized to prevent cracking and crumbling. What are Novalashes made of? 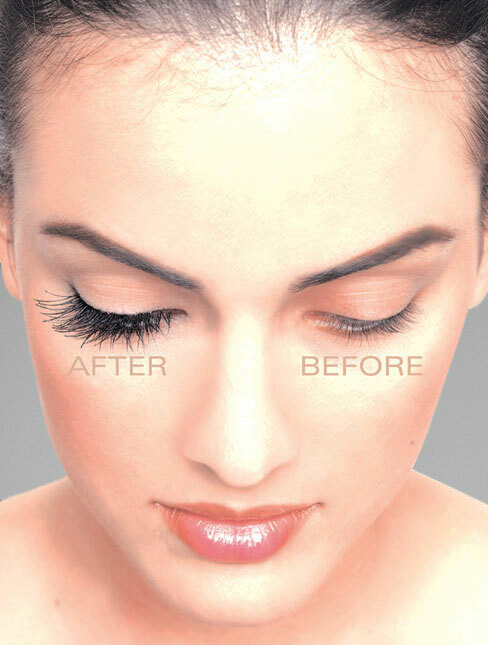 Novalashes are made of synthetic fibers that look and feel identical to a natural lash. Novalash also offers a Mink lash which is a softer feel then traditional extensions. How long do Novalash Eyelash Extension last? When properly applied Novalash will last for the full life cycle of your natural lash. Each lash has an average growth cycle of 60 days. When your natural lash falls out the synthetic lash will fall with it. To fill in the spaces where any of your natural lashes may have fallen out, you will need to come in for touch up appointments every 2 – 4 weeks. The time varies based on your age, color of hair, and ability to take care of your Novalash extensions. For best results and to get the most out of your extensions it is strongly suggested to couple your lashes with the Novalash After Care Kit. It consists of the 3 in 1 Make-up Remover, Cleanser and Conditioner Pads, mascara, and an eyelash brush. What can I expect to happen during the procedure? Your lashes will need to be completely clean, free of make-up and mascara. Your Professional Extensionist will prep your eyes with surgical tape. You will relax for up to 2 hours as your extensions are applied one by one to each of your natural lashes and sealed for the longevity. You may even fall asleep, the procedure is so relaxing. The end result is longer, fuller, voluminous lashes. Yes, you can wear Mascara by Novalash. Be very gentle when removing your mascara. Only use CleanLash by Novalsh make up remover, cleanser & conditioner pads. Remember do not pull or rub the extensions. How safe are Novlash Eyelash Extensions? The lashes are applied directly to the natural lash, never applied to the skin. The procedure is pain free and will not pull out your natural lashes. The eyes should remain closed and protected throughout the entire procedure. How do I know if I am allergic to the adhesive? If you are unsure if you are allergic to the adhesive, your extensionist can preform a patch test on the back of your hand, which will reveal if you have an allergy. Some individuals who are sensitive or have allergies to other adhesives should have a patch test performed. Can I use a lash enhancer or growth serum with my extensions? Yes, you can use any of the serums that promote lash growth. Eyelash/eyebrow tonic is a great compliment to the extensions. Our products are made from all natural botanicals and herbs that promote the healthy growth of your lashes and brows. There are no chemical side effects that some other enchancers can cause. PLEASE NOTE: We can no longer accept clients who had their full sets applied by other salons/individuals. We apologize for the inconvenience, but with the sudden surge of unqualified individuals attempting to do this service, we are seeing an increasing amount of shoddy and damaged lash applications. As a result, we cannot in good faith work “on top” of another’s poor work. If you unknowingly trusted someone unqualified to apply your extensions and are having a bad experience, please schedule a professional removal. A full removal will stop your lashes from shedding in clumps– leaving you with bald spots. If you would like a proper, full set applied immediately after removal, please schedule for that as well.